The Row, by designers Mary-Kate and Ashley Olsen, has once again displayed a collection of classic and exquisite looks on the runway this season at the Beaux Arts limestone mansion in New York. The collection infuses a brilliance of Asian-inspired zest with a classic bold elegance, remaining true to the nature of the brand. Once again the Olsen twins construct the ultimate chic and fashion forward collection by simultaneously incorporating a simplistic-in-nature while sophisticated-in-cut approach. 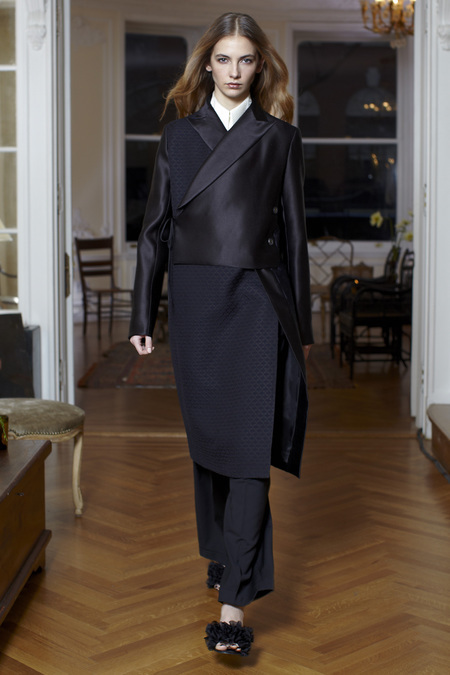 Mary-Kate and Ashley take chic to a novel level with their Fall 2013 collection on the runway this season.